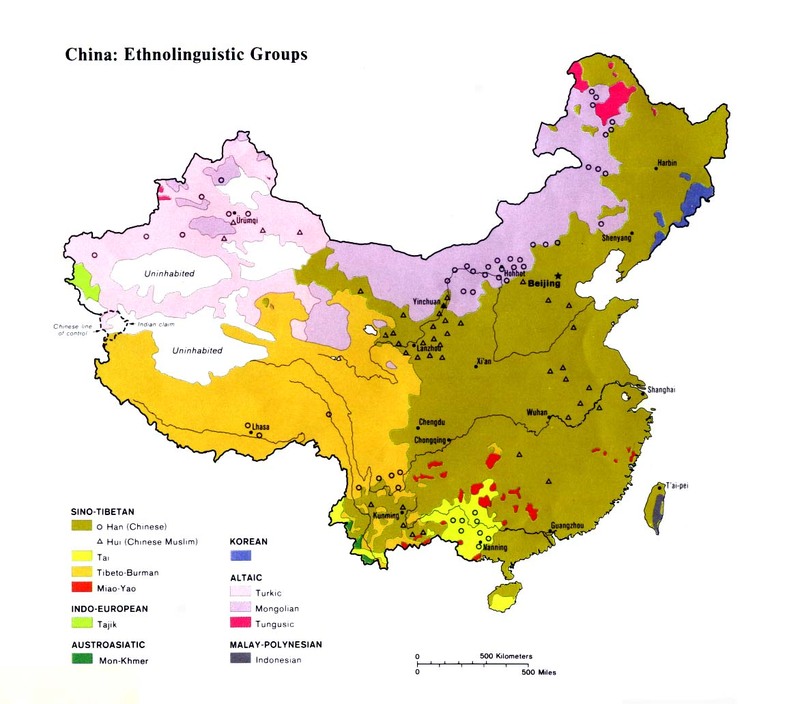 I mentioned China’s ethnic and linguistic diversity in a comment on Multi-ethnic communities – history’s lessons on Jim Belshaw’s blog the other day. I referred to the list Wikipedia gives. There is a map there, which I reproduce below. Click to enlarge. We often forget this complexity, not surprising in such a large area. We also forget that Cantonese, spoken, and Mandarin are mutually incomprehensible, as different as Spanish and English. The Chinese writing system allows, however, written communication between the two, pronounced differently in each case. Some of the other language groups are not Chinese at all. Unity has always been important to Chinese governments, so while there is a degree of recognition of this diversity at an official level there is strong objection to nationalist aspirations or “separatism” by the minorities, some of which are very large. In Europe many of them would have become separate countries long ago. Traditionally, periods when China has divided into smaller entities are regarded as periods of weakness. Oh dear, I agree with Peter Costello! Peter Costello, Treasurer in the Howard Government, is famously about to drop out of parliamentary politics, even if the majority of voters would have him rather than Malcolm Turnbull as Opposition Leader. Nowadays he writes regularly for The Sydney Morning Herald. Today he weighs into the China syndrome. I am sure many Costello-haters, and there are many, would love to pin “racism” on this article, but I don’t believe that would be fair. What he says, based on my own limited experience of doing business with China, is actually true. 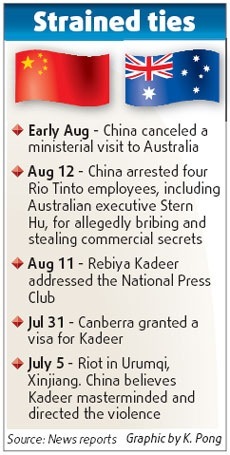 …Stealing state secrets is not a common crime in Australia, and it is certainly not a crime to obtain information about your customers and how they might approach a commercial negotiation. If you do obtain such information, it cannot be a state secret because companies are privately owned. In China, where the state owns so many companies, commercial information becomes a state secret, which tells you that these are not corporations in the way we understand them. Supporters of the Chinalco proposal argued Chinalco was just like any other corporation. However, Chinalco was even more intertwined with the Chinese Government than other companies, as its chairman was an alternate member of the Central Committee of the Communist Party. We should remember that the Australian Government did not rule that the Chinalco bid was contrary to our national interest. It never expressed a view about the application. As I found, only in China can you get copyright clearance for a whole group of authors by approaching the Department of Culture in Beijing. The state, rather than the authors, controls the copyright.